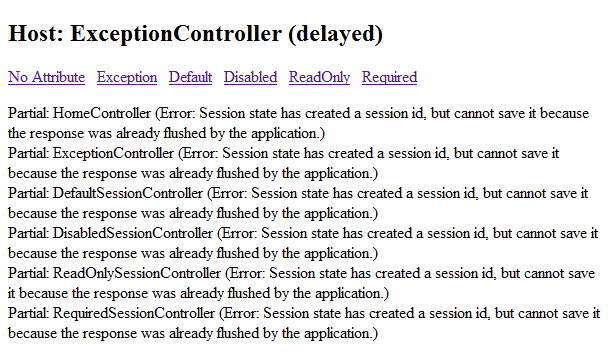 One of the new features of ASP.NET MVC 3 is a controller-level attribute to control the availability of session state. In the RC the attribute, which lives in the System.Web.SessionState namespace, is [ControllerSessionState]; for RTM ScottGu says it will be renamed simply [SessionState]. The attribute accepts a SessionStateBehavior argument, one of Default, Disabled, ReadOnly or Required. A question that came up during a Twitter discussion a few weeks back is how the different behaviors affect Html.RenderAction(), so I decided to find out. I see this is the key finding to remember: an action that depends on Session, even if its controller is marked with SessionStateBehavior.Required, will be in for a nasty NullRef surprise if it’s rendered by controller without. It would be nice if the framework either gave some sort of warning about this, or if they used a Null Object pattern instead of just letting Session return null. It’s pretty clear the issue has something to do with where RenderAction() happens in the request lifecycle, but it’s unclear how to resolve it short of accessing Session in the host controller. So there we have it…a comprehensive testing of sessionless controllers and RenderAction for the ASP.NET MVC 3 Release Candidate. Hopefully the inconsistencies of the latter two cases will be resolved or at least documented before RTM.